Satellite image showing the Amundsen sea sector of West Antarctica. The world’s largest hunk of ice, the Antarctic ice sheet, holds enough frozen water to put cities like Miami several hundred feet under. How much Antarctica shrinks in the future will depend on the balance between what’s melting away, and what’s being added when it snows. A new study published in the journal Climate of the Past has some (small) good news as far as snowfall is concerned: it’s going up. Since the 19th century, snowfall across Antarctica has increased by about 10 percent. It isn’t nearly enough to offset sea level rise from ice melting, but the numbers are still impressive. As a press release points out, the continent is packing on about two Dead Sea’s worth of new ice each year. “Our new results show a significant change in the surface mass balance (from snowfall) during the twentieth century,” lead study author Elizabeth Thomas of the British Antarctic Survey said in a statement. Lead study author Liz Thomas taking a measurement of an ice core. For the study, the authors compiled records from 79 ice cores collected across the Antarctic continent over the past few decades. Each of the cores offers a snapshot of snowfall in a certain region—from the fast-melting West Antarctic Ice Sheet to the cold, dry East Antarctic Plateau—going back to at least the mid-20th century, and in many cases, to the early 19th. 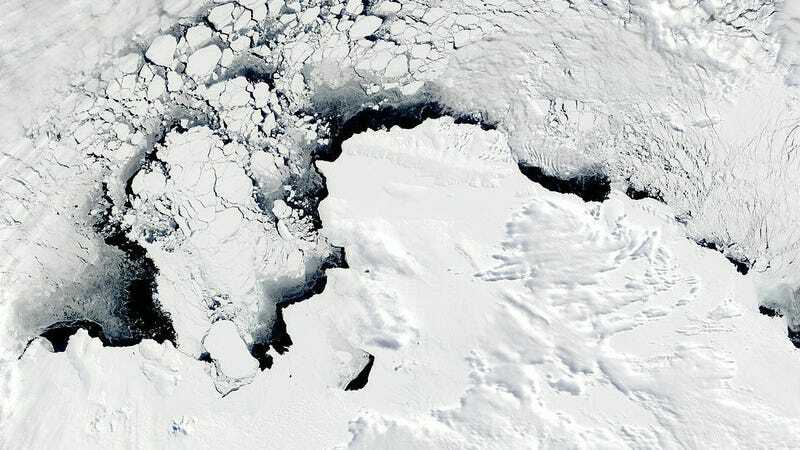 The dataset revealed that Antarctica gained 272 billion tons more ice per year in the first decade of the 21st century compared with the first decade of the 19th. Put another way, the additional snowfall has offset 0.02 mm of sea level rise per decade since 1800. That’s tiny compared with the several millimeters a year of sea level rise coming from Antarctica’s melting ice each year, but it ain’t nothing. As the study notes, it basically offsets sea level rise from shrinking Patagonian glaciers. Most of the extra snow has fallen on the Antarctic Peninsula, while a smaller amount accumulated on the much drier (but vaster) East Antarctic Plateau. In an email to Earther, Bell said that the results aren’t surprising. We know that a warmer atmosphere holds more moisture, so we can expect an uptick in snowfall. But the work is important because it “compliments our understanding from space-based observations,” which carry a lot of uncertainty. Glaciologist Peter Neff at the University of Washington, who also wasn’t involved, agreed that the study’s conclusions weren’t that surprising. But he emphasized that gaps in the data—both in space and time—continue to limit our view of how Antarctica is changing. “Although this paper will likely become a classic compilation of our view in 2017, the 79 ice cores analyzed are spatially restricted,” he told Earther, noting that West Antarctic cores are biased toward the highest ground, and that East Antarctic record is biased because of a cluster of cores in Dronning Maud Land, a vast chunk of ice annexed by Norway in 1939. Neff also noted that most of the ice cores were collected in the last 20 years, meaning trends cannot be analyzed up to present day, when we’d expect the imprint of climate change to become most obvious. In order to really understand how Antarctica is changing right now, he’d like to see a mass ice core collection effort spanning the entire continent. “If we think of ice cores a bit like weather station records, you can see that we both need them everywhere and all the time,” he said.